We are so excited to welcome back a fabulous singer, songwriter, and musician, Tret Fure! Tret Fure began her career at the age of 16, singing in coffeehouses ad campuses in the Midwest. At 19, she moved to LA in hopes of obtaining a record deal. Within a year she was performing as guitarist and vocalist for Spencer Davis, touring with him and penning the single for his album “Mousetrap”. She went on to record her own album in 1973 with the late Lowell George of Little Feat as her producer. 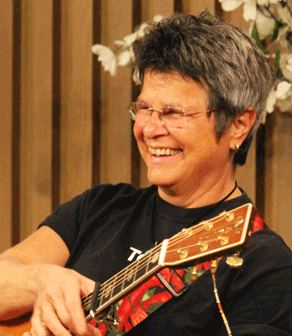 A prolific artist in the contemporary singer-songwriter arena, Tret Fure has released 15 albums and CDs over the course of her 48 year career. 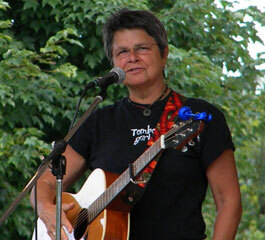 Now after 7 acoustic releases on her own label, Tomboy girl Records, she has re-established herself in the folk world, winning the South Florida Folk Festival Singer/Songwriter Competition for Best Overall and Best Up-Tempo Song, as well as the prestigious Jane Schliessman Award for Outstanding Contributions to Women’s music. Tret Fure - "Roses in November"
"Roses in November" is yet another masterpiece from Tret. Exceptionally crafted songs delivered with passion, conviction and, yes, soul. Tret weaves magic both in the lyrics and between the lines. This will certainly be on my "Best of 2018" list. Tret has released one of the best cds of 2018 entitled "Roses in November". "She's a singer-songwriter who draws you into her personal world without self-indulgence because her themes are universal and the songs, well-written. Tret's also a folk singer, touching on important issues like gender identity, and peace. Leaning more toward contemporary folk than anything else, there are touches of Cajun music and bluegrass; stellar musicians include Gina Forsyth on violin, June Millington on guitar and others with percussion, bass, cello, piano, and mandolin. Most of the arrangements seem built around Tret's beautiful acoustic guitar work and her expressive voice. She's the queen of love songs, evidenced by the title cut "Rembrandt Afternoons," "Riverbank", and "Now I Know." Given that every musician on the planet has a song about love, it's hard to write anything that feels moving and original; Tret could teach the class. "Tender" has a wonderful accordion and a positive message about acceptance. There's a lovely finger picked guitar with touches of fiddle in "The Fishermen of Bristol Bay." The poignant story is of a native community that has fished the bay for thousands of years and the challenges presented when a mining company tries to move in. "A Moment in Time" is one of my favorites. The lyrics are lovely, about observing a second in time and drawing conclusions. She sings of finding a photograph featuring two women and wonders: "They could be lovers or just friends / Maybe sisters on a stroll." She ends by asking if she sees too much in this brief moment. Pamela Means's guitar gives this piece a jazz/pop feel. In "Foolish or Foolhearted," Tret's delicately finger picked guitar weaves around lyrics where she muses about gifts – a scarf, a cup and a stone – and lets us know that even though those objects were lost, it's not a comment on her affection for that person. How many of us have panicked when we lost that ring or special card? In "Slipper Moon" she uses dog and cat metaphors to tell us about longing for the comfort of home. She ends this wonderful release with "Worry Stones." Recorded simply with her warm acoustic guitar and voice, this one shows you how she is in concert. While the band is great, she can still do it with just a simple guitar and vocal. In one of her songs, she sings, "When you think you just can't sing / You find a better song." You can't find much better songs than Tret Fure's. I love this album. So will you." Tret Fure - "Another Unseasonable Season"
For those who love Tret Fure's music, and for those first coming to the songs of this talented singer/songwriter and producer, this recording is for you. Tret opens both heart and mind and gives herself over to the music. And it is beautiful music, indeed, addressing where we have come to in life, and where we are going--gathering our loved ones around us all along the route. There is wonderful playing by all of the musicians involved. Tret Fure may be offering us A Piece of the Sky, but she offers us her open heart as well. It is hard not to reach in and find a song that speaks directly to you, the listener. Reach in and listen. Tret Fure with Brother Sun - "Grace of God"
We hope that you will join us for this amazing concert. As always, our house concerts are by invitation and all proceeds go to the artist. Please visit the website of Tret Fure at tretfure.com to learn more about this amazing performer. More great artists coming to Singing Oak in 2020! Singing Oak House Concerts is located in West Harwich at the home of Ralph Diamond and Gail McAleer. All concerts are non-commercial, private events. Admissions are collected as donations, 100% of which go to the performing artist. This promises to be another amazing concert and rare opportunity to experience this amazing artist in a warm, Cape Cod setting. Thanks and we look forward to sharing the music together! Some of our house concerts fill up so please RSVP early. 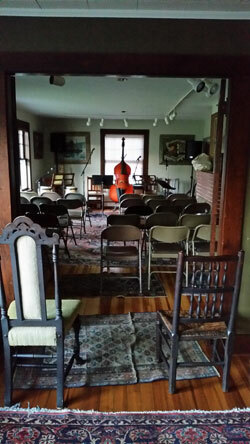 Our house concerts usually begin at 7:00 P.M. with a potluck appetizer/dessert social gathering starting at 6:15. Most concerts are hosted either on Sunday or Monday evenings and our performers usually appear on Bob Weiser's "Old Songs' Home" radio show on WOMR on Monday morning. Check our website for more details. A voluntary suggested donation of $20 per person to the musician(s) is requested. This is payable in cash at the door. No one turned away for lack of funds. Remember, 100% of all contributions go directly to the performers so if you RSVP and can't make it, please let us know so we can give your seat to someone else. Most of the musicians we host have CDs available for sale during the break and after the house concert.